Can be eaten as-is, used as seasoning, fried in a pan to make even more fragrant, or used in sesame broth. These organic golden sesame seeds have been luxuriously roasted in small batches at high temperatures. We make sure to use the richest and most fragrant golden sesame seeds. Sesame is a high-nutrition food rich with vitamins and minerals. Golden sesame in particular, because it can contain more than 60% plant oils, has a strong fragrance and full-bodied umami flavor. (In comparison, white sesame has 55% oil, and black sesame has 50% oil). 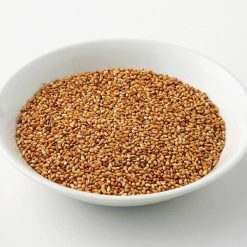 Golden sesame is rich in antioxidants, particularly sesame lignan, and is rich in iron and calcium. Golden sesame has around 5 times as much iron as spinach, and about 7 times as much calcium as komatsuna (Japanese mustard spinach). One serving of golden sesame is 100g. Golden sesame can be used as a flavoring or topping in a wide range of Japanese foods as well as other dishes from around the world. It can lend a delicious smoky flavor to sushi or even plain rice, and can be added to salads for texture and variety. Our golden sesame seeds can be used and eaten as they are, or fried in a pan to bring out even more of their flavor and fragrance. Sesame seeds can also be made into broth. 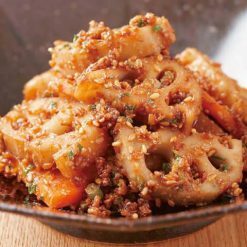 To make all-purpose sesame broth, combine 1 tablespoon four-season broth base, 1 tablespoon crude sugar, and 4 tablespoons organic golden sesame (ground finely). 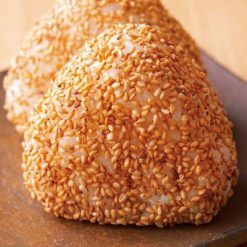 Golden sesame seeds can even be used to jazz up sweets, including on all sorts of cookies and crackers and as an outer coating on mochi (a dessert made of pounded sticky rice). This product contains organic golden sesame (Turkey). This product is not suitable for anyone with allergies to sesame. The recommended shelf life for this product is 10 months.